Between the Xbox One, PS4 and Wii U, there's no shortage of awesome gaming consoles available on the market. 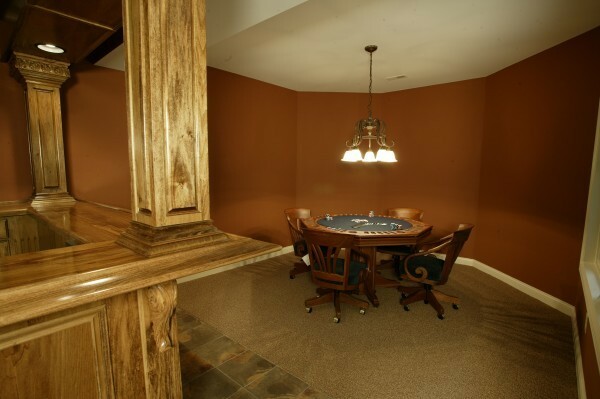 The variety that's available is also why it's possible to create a gaming room that your entire family will enjoy. Since switching between consoles is as easy as changing the current input on your TV, your teens can enjoy playing the PS4 when it's just them, and then everyone in your family can get in on some Wii action when you're all together. The two most important items to find for this room are a big TV and a very comfortable couch. One of the really cool things about creating this type of room in your house is everyone will be able to enjoy it individually, as well as together. Your kids can have their friends over to enjoy a night of poker, sodas and snacks. Additionally, you and your spouse can have your own men's and ladies' nights in this room. Then during the weekends when your whole family is together, you can all enjoy playing cards in this room. In fact, you can even bet on things like who's going to be doing certain chores during the upcoming week! Whether you love foosball, shuffleboard, air hockey or several of these classic games, they can create a really awesome space. The main thing to keep in mind is in addition to tables, you'll want to have some seating in this room so anyone who's not currently playing can still hang out comfortably. What If You Don't Have Any Extra Space? While there's a lot of variety in all the different ideas we covered, the one thing they all have in common is they require space. Specifically, an extra room is the ideal space for an area that's fully dedicated to fun and games. If you don't currently have this type of space, you may be wondering what you can do to create an area where your entire family can have fun. If you've already been thinking about moving, one option to seriously consider is having a custom home built. The reason this option is so appealing is not only will it allow you to ensure there's a room solely dedicated to the types of games you want to play with your family, but it will give you the same level of control over the entire layout of your home. By opting for a custom home, you can create the perfect space you and your family have always wanted to call home.